Sean Dyche was frustrated at the decision to award Manchester City the penalty that broke the deadlock at the Etihad Stadium. 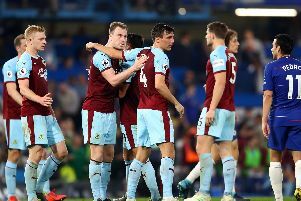 However, he accepted the controversial spot kick didn’t necessarily alter the result, as Burnley’s unbeaten away record was ended by the leaders. Just after the half hour, after saving from Kevin De Bruyne, Nick Pope came to close down Bernardo Silva from the rebound, and the Portugal forward made the most of minimal contact. Dyche was disappointed to see a penalty given in the circumstances: “They are a fine side and I can’t say it affected the outcome. “But although there is contact – and I have seen that there is now - I feel it is minimal. “To get that high off the floor you’re your hands above your head is a skill in itself. “If I kicked my kid in the garden he wouldn’t fall like that. “There has to be a but of almost what I’d call honour in the game. “That’s out of the window because it’s not there. Dyche has spoken out several times about simulation, and there is a potential two-match ban in place for players who are proved to have dived in situations which lead to penalties, goals, or opponents being sent off. However, Watford’s Richarlison wasn’t penalised last week after winning a penalty against Arsenal, and Dyche admitted: “I have brought up my opinion on cheating, the FA has a rule which already does not work already because we saw how it was when the Watford lad was not banned. “There’s contact but you can’t fall like that as a 13 stone professional footballer…how can you fall when someone touches you that softly? “No one seems to want to change it. At end of the day there is contact today, I just don’t think there’s enough to fall. “It’s an important line – I have said I was a centre half and understand gamesmanship, but that was stretching it today. “It’s a professional understanding of the game, and today is right on the line. He added: “Have you noticed they always stay on their feet when they can score a goal? I’m talking the bigger picture, not the player today. “I don’t know him, I can’t comment on him, he might say there was enough contact to go down and I’m not saying if it had gone for us we would have beaten Man City either because they are a fine side. “It’s tough to come here and expect to dominate the ball, or to press all the time. “They have a keeper who is ready to kick it. They’re more effective, their pressing lines are better.